Monstrous Georgetown Art Attack on October 8! 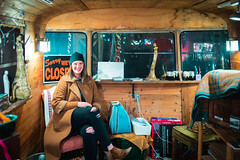 Enjoy a beautiful art filled autumn evening in Georgetown with critically acclaimed cultural exhibits, stellar artists, makers and musicians in Seattle’s oldest neighborhood. Industrial, contemporary visual and performing arts, music and activities throughout the historic business district. Walking? Be sure to hop on the FREE Art Ride to experience our west end studios and galleries such as Equinox Studios, studio e and SANCA. Running every 15 minutes in a full circle so you don’t miss a thing! Fantagraphics Bookstore & Gallery welcomes back Seattle native Charles Burns, one of the founders of the alternative comix movement, to discuss his masterpiece Black Hole and other seminal works as part of Fantagraphics 40th anniversary festivities. The critically acclaimed exhibition R. Crumb: Early Works, 1965 – 1967 remains on view. November 2, 2016. All City Coffee exhibit Friends | Artists | Heroes, the photography of Lisa Scott Owen is continuing thru October. An inspiring portrayal of surfers, skateboarders and other artists in motion, bringing light to their their stories thru photography. Rainier Glass Studio invites you to become part of the glass art experience! Browse their gallery of NW artists unique blown glass art, watch the live demonstrations and be inspired to reserve a spot blow your own seasonal piece! Open for Art Attack, 6-9 PM. Bridge Productions and guest curator Tracy Rector will present a gathering of contemporary work by Indigenous artists begun with her landmark show this past January, YOU ARE ON INDIGENOUS LAND, an exhibition reminding us of where we stand and the importance of truth, place, and identity. Featured artists include Lauren Monroe Jr, Raven Julia Juarez, Nahaan, and Steven Paul Judd. Opening reception, October 5, 6-9 PM. 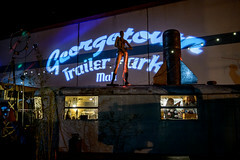 Also open for Georgetown Art Attack. The Hammie Salon celebrate their 1 year anniversary with the magical work of Abbe Johannes. Using her face and body as canvas, Johannes creates characters and stories, then photographs the result to share with her audience. Her creations are mesmerizing and will draw you in, as you experience the flawless merging of reality and imagination. 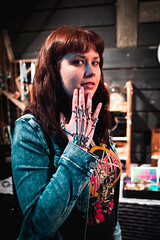 With October leading to Day of the Dead celebrations around the world, stop in to be inspired by Abbe’s amazing talent. Opening festivities begin at 5pm, October 8. Krab Jab Studios presents Gods of the Wyld: Allen Williams, with Forest Rogers, Stephanie Pui-Mun Law, and the Schiflett Brothers. Illustrator Williams is known for his fluid, dark and mysterious drawings, and in this show he releases the lesser known gods of a forgotten past. Supporting this show is new work by sculptors Forest Rogers, the studio Schiflett Brothers, and watercolorist Stephanie Pui-Mun Law. Opening October 8, 6-9 PM. 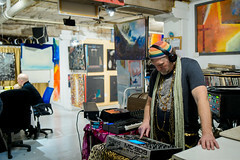 Eight and Sand hosts The Tarot Show featuring 78 tarot Carnival. It’s time for the annual Tarot show! This year will feature several artists from the 78 Tarot Carnival deck as well as many local and national artists who will show their own interpretation of their chosen card. There will be decks available and possibly a tarot reader. Georgetown Trailer Park Mall a unique and lively collection of trailers selling hand crafted jewelry, art and vintage goods. Open late for Art Attack, the fun never ends! Status Ceramics invites you to visit their studio! Open for the first time to the public during the Art Attack, with hand-makes one of a kind ceramic tile designed by local Seattle artists. Their tile is hand pressed and glazed to order in their Georgetown studio and they are excited to share what they do. Stop by for unique gift tiles, insight into their tile making process, or just to say hi. Open from 6-9 during the Georgetown Art Attack. studio e exhibit GLUE a group collage show, with works of Brian Cypher, Warren Dykeman, Damien Hoar de Galvan, John Rizzotto, Curtis Steiner, Gillian Theobald and Heather Wilcoxon continues thru October.